A popular Twitter page, Television Nigerian (@tvnigerian), has been directed to the social media platform to share a hilarious and dramatic video clip of a marriage proposal in Benin, the capital of the Edo state. The video shows the moment when a young man knelt down to propose to his girlfriend while a guitarist was serenading them with love songs. When it was time to take out the ring and begin the proposal, the man was seen looking in his pockets, everything was in vain. Annoyed by the disappointment, the woman who seemed humiliated slapped the young man's face, and eventually left while people stared in amazement at a fast-food restaurant. 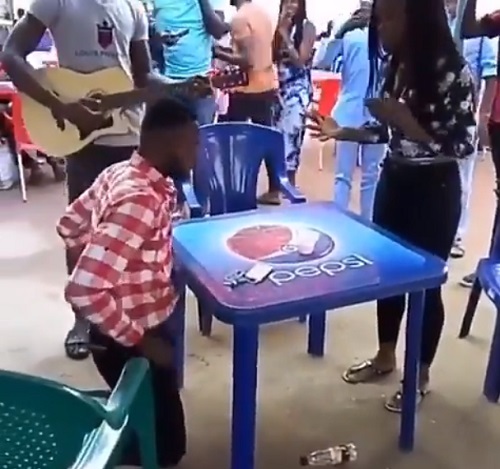 TV Nigerian shared the video and wrote; "So apparently this happened in Benin, right in front of Uniben maingate in the same Naida bakery that was rumored to be sold by a Yahoo guy, this guy was supposed to propose the love of his life ... But then he could not find your ring ... "